Format Factory is one of the popular software for converting audio and video files in windows. It can converts your audio files from one media format to other supported formats and one video format to another video formats. 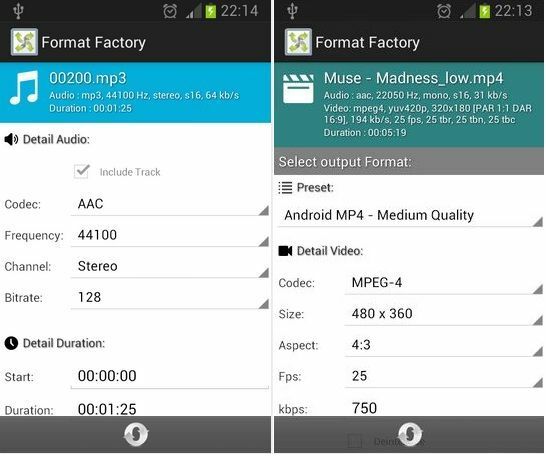 Format Factory is now available for Android devices, so you can convert any media files or movies within your Android phone. How to Convert Audio & Video Files in Android? The process is very simple. You have to click on the “+” symbol on the top right and select your file type whether audio or video. Then you can select the custom presets for quick conversions or you can modify the entire conversion settings. For Video, you can change the video quality, resolution, aspect, bitrate and more. For Audio, you can change the codec, frequency, channel, bitrate and more. After you have done the settings, finally click on the convert icon at the bottom of the app. That’s all. 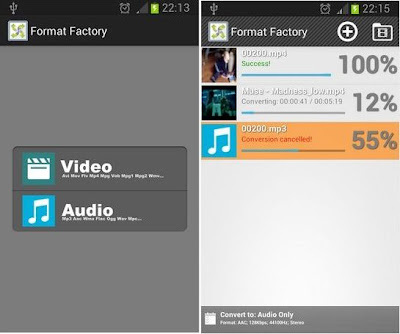 Format Factory is a simple and free video converter for Android phones and tablets. The video formats supported are flv, mp4, avi, wmv and more. It supports mp3, aac,flac and mp2 formats for audio files. There is no support to convert a video to audio file. Otherwise it is the best video converter within Android, you can do the work without desktop computer.